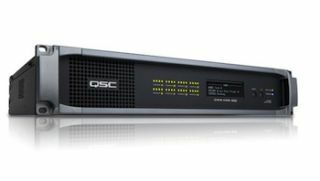 QSC Audio Products has announced the next generation of Q-Sys products, designed to deliver digital networked audio solutions for the widest range of applications. The Core 500i and Core 250i provide advanced centralized processing, routing and control for contractors and consultants needing a solution for smaller venues such as restaurants, nightclubs, stores, schools and churches. These two new Core models are fully integrated solutions, each with eight card slots on-board. The Core500i is capable of up to 128 network channels while the Core 250i provides up to 64 channels. I/O is selectable via the various Q-Sys I/O cards. Options also include the MTP-64, and MTP-128 multitrack players. Like all Q-Sys Cores, these systems run under a customized Linux operating system on Intel microprocessors and motherboards. IT connectivity is implemented utilizing Layer 3 Gigabit networking protocols and standard Gigabit Ethernet hardware. The systems are capable of providing simple and failsafe redundancy for mission-critical applications. All system design, configuration, administration and control operate under a simple and straightforward GUI. Additionally, custom user control panels are easily created and can be displayed on any Internet-connected PC, iOS device or QSC's own Touch Screen Controllers (TSC-3, TSC-8). Any incoming signals may be mixed and routed to any output and nearly unlimited DSP is provided, including Acoustic Echo Cancellation. Also newly announced is the I/O-22 analog I/O box. It is a compact, standalone unit designed for widely distributed audio sources or destinations such as individual rooms in a multi-room venue (judicial chambers, classrooms, VIP suites, etc.) It provides two mic/line inputs and two line outputs and connects directly to the Gigabit Ethernet network. It is powered by PoE or 24 VDC and includes an 8.5 watt mono amplifier and mounting plate for discreet and compact installation.